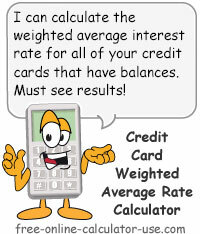 This calculator will calculate the weighted average APR for all of your credit cards that have a current balance. Unlike most credit card interest calculators, this calculator will calculate the current finance charge for each card, and then compute the credit card average APR using a weighted formula. Finally, the results include a button to create a printer-friendly report, as well as a 60-month minimum payment interest cost schedule. Calculate weighted average interest rate on all credit card balances combined. To add a credit card, enter the name, balance, and interest rate. When you're satisfied with the entries, tap the &plus; button (may also appear as "Add" or "Add Card" depending on the width of your device). To edit a credit card in the list, tap the radio button in the Edit column. This will load the card into the form for editing. When you're satisfied with the changes you've made, tap the S button (may also appear as "Save" or "Save Changes" depending on the width of your device). To delete a credit card from the list, tap the radio button in the Edit column. This will load the card into the form for deleting. Tap the − button (may also appear as "Delete" depending on the width of your device). To clear the form to create a new credit card entry, tap the C button (may also appear as "Clr" or "Clear" depending on the width of your device). To add a credit card to your credit card interest rate analysis, click the Add Credit Card Row button. Then complete the row of entries for the card you are adding. To remove a credit card from your credit card interest rate analysis, click the X button in the left-hand column of the row you wish to remove. Important! The entered credit cards are saved in your device's random memory (temporary storage), which means that if you surf to another calculator or close this browser window you will need to re-enter your cards. The number in this column represents the percentage of total interest charges for the month that each card cost represents. Tab out of each changed entry field to recalculate the percentage. Enter the name of the credit card as you want it to appear on the printed report. Note that if the card statement lists more than one interest rate (1 for purchases, 1 for cash advances, etc. ), I suggest you enter the balances as separate cards (Visa purchases, Visa cash, etc.). Enter the statement balance of the credit card, without any dollar sign or commas. Enter the annual interest rate of the credit card. Enter as a percentage without the percent sign (for .06 or 6%, enter 6). If this credit card has more than one interest rate (1 for purchases, 1 for cash advances, etc. ), enter the individual rate balances as separate cards (Visa purchase, Visa cash, etc.). Based on your statement balance and interest rate, this is how much interest you will be charged on the balance for the current month. Tab out of each changed entry field to recalculate the interest cost. Based on your balance and interest rate, this column will show the percentage of the total current month interest that each card represents. This is the weighted average APR of all of your entered credit cards. This is how much each 1% of the weighted average APR is costing you. In other words, for each 1% you are able to lower your average APR, this is how much you will save each month if the balances stay the same. For each credit card that has a balance, enter the name, statement balance, and interest rate, and then click the "+" button (may appear as "Add" or "Add Card" depending on the width of your device). If a statement has more than one interest rate, enter the rate balances as separate cards (Visa purchases, Visa cash, etc.). Once you have all of your cards entered, click the "Calculate Card Avg APR" button. This will display the calculated weighted average interest rate, a summary, a 60-month minimum payment interest chart, and a button to create a printer-friendly list of your entered cards. What weighted average is and why it's important. A weighted average takes into consideration how much each card's finance charges represents of the whole -- giving more weight to the interest rates of cards with higher balances. Suppose you have two cards. The first card has a balance of $5,000 with an annual percentage rate of 18%. The second card has a balance of $1,000 with an annual rate of 12%. If you use the common method of calculating the average APR (known as the "mean" average), you would add the two rates together and divide by two, giving you an average APR of 15% (18% + 12% = 30% ÷ 2 = 15%). However, if you calculate the actual finance charge for the two cards, you will see that the numbers don't add up. If we divide 15% by 12 to get the monthly rate of .0125 (.15 ÷ 12) and multiply the balance by that result, the total finance charge for the two cards would be $75. Obviously, that is not correct. In order to get the actual average rate, we need to work backwards. First we take the $85 and divide that by the total balance to get a monthly rate of .0142 ($85 ÷ $6,000 = .0142 rounded). Multiplying .0142 by 100 and then by 12 gives us the actual average annual rate of 17% (.0142 * 100 = 1.42 * 12 = 17% rounded). The reason the actual average is higher than 15% is that the card with the higher balance has more influence (weight) on the average than the card with the lower balance. Hence the term "Weighted Average." Now that you understand what "weighted average" means, you should now have a clear idea of how to prioritize your efforts to get your interest rates lowered. Since it's the weighted average that determines how much interest you will pay on all of your cards, you will want to focus all of your efforts on lowering the rates of your highest rate, highest balance cards, because they carry the most weight.